Jockey Paco Lopez made an early return to South Florida Thursday, riding three horses on Thursday's twilight program at Gulfstream Park. The 32-year-old Mexico native, who has won numerous titles since he ventured to South Florida, most recently finished second in the jockey standings at Monmouth Park with 71 winners. Lopez, who rode in Kentucky last fall, was based at Aqueduct full time last winter for the first time while winning 12 of 65 races during visits to Gulfstream for stakes mounts. Lopez won the Championship Meet title in 2010 and is only one of only four jockeys to win 100 or more races during the premier Gulfstream meet. 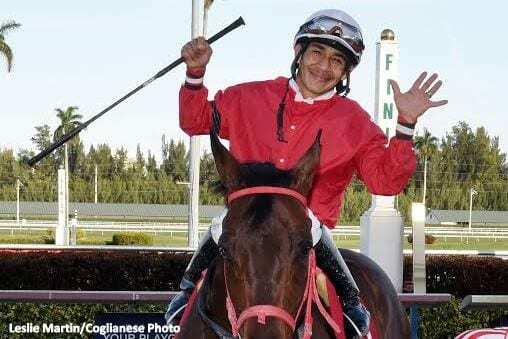 This entry was posted in People and tagged Florida horse racing, gulfstream park, Jockeys, paco lopez by Press Release. Bookmark the permalink.